This recipe is from Susan Wyler’s Cooking for a Crowd. 1. Preheat the oven to 425. Butter 3 large heavy baking sheets. 2. In a medium saucepan, combine the water, butter, salt, black pepper and cayenne. Bring to a rolling boil over moderately high heat. Add the flour all at once and beat with a wooden spoon over the heat until the dough is completely blended and masses together in the center of the pan. 3. Scoop 1/3 of the hot dough into the food processor. With the machine on add 4 of the eggs through the feed tube, one at a time. Blend until smooth and satiny. Turn into a bowl. Repeat 2 more times with the remaining dough and eggs. (there’s no need to wash the bowl in between batches.) See modifications below for half the recipe. 4. Add the Parmesan and Gruyere cheese to the dough and mix well with a wooden spoon. 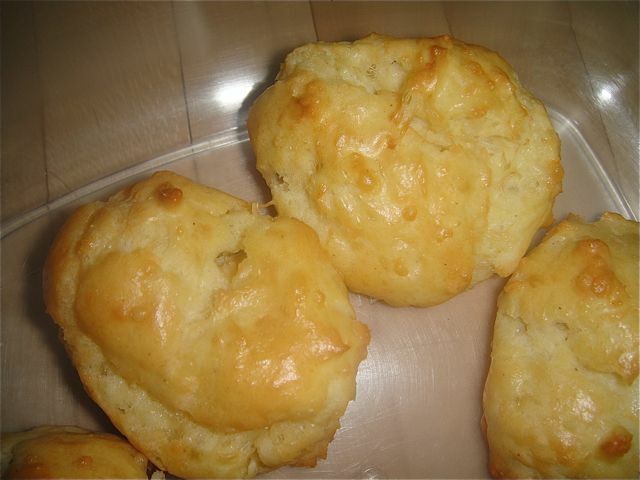 I have only made mini gougeres so I drop heaping teaspoons onto the prepared baking sheets, leaving about 2 inches in between and bake at 425 for about 15 minutes or until golden brown. I have only made half the recipe. I scoop half the dough in the processor and add 3 eggs, one at a time. Transfer to a bowl and then add the second dough and add 3 eggs, one at a time to the processor. Transfer this dough to your bowl. I then add the cheeses. 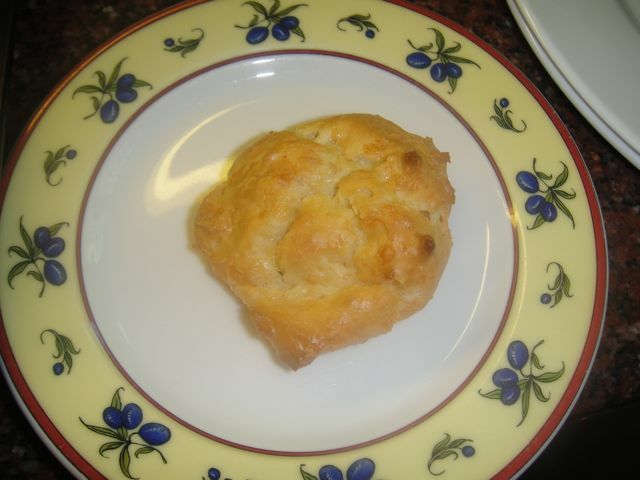 As the gougeres can be frozen 2 months in advance and frozen, I do not bake until very crusty and golden brown. 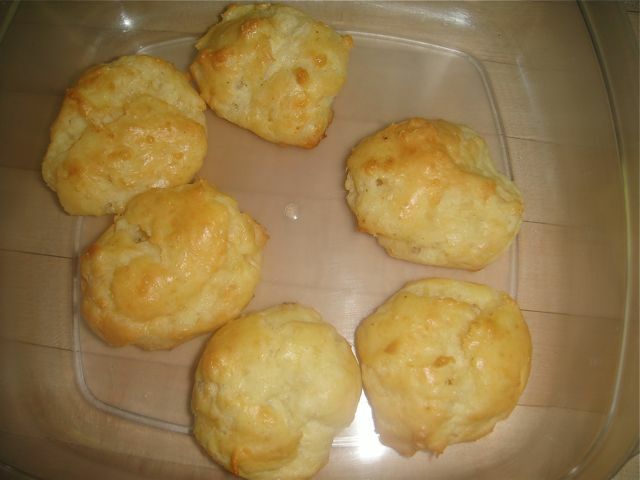 The above gougeres were cooked for about 15 minutes. 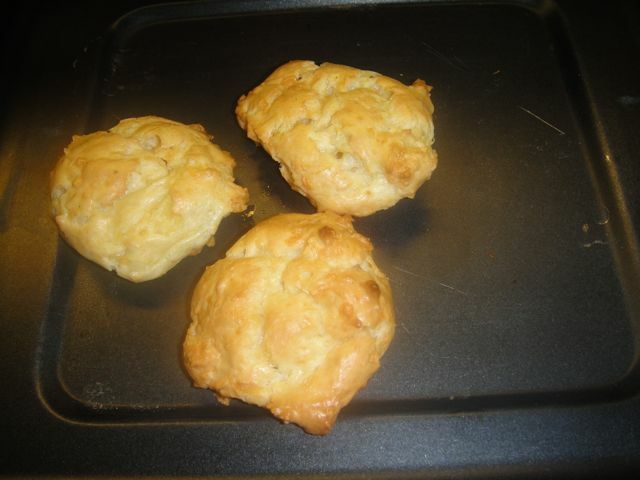 I will reheat them until they are really golden brown and crusty.